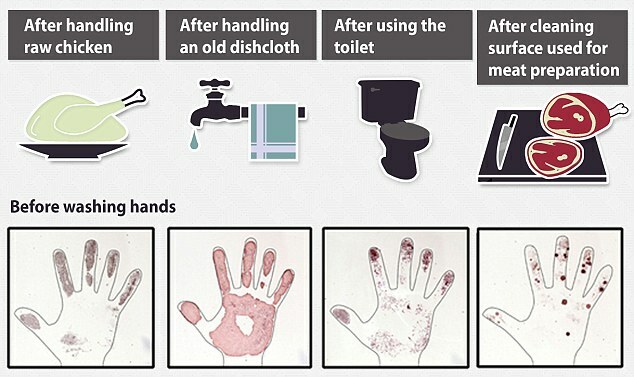 Public Health England (PHE) is supporting the World Health Organization’s Clean your Hands campaign by making that which is invisible, visible. Our hands touch hundreds, possibly thousands of surfaces each day and hands play a key role in spreading bacteria and viruses, some of which may be harmful to our health. They cause illness by what in scientific terms this is called the ‘faecal-oral’ route of transmission. This is where we touch surfaces and then put our hands, and the bugs - including ones that are found in human faeces - into our mouths. Bacteria from faeces are spread around when people don’t wash their hands after using the toilet, changing nappies, handling cat litter and similar activities. This striking selection of photos is from pressing real hands onto a growth medium that only allow germs of potential faecal origin to grow. This was done after touching everyday objects and contaminated foods or after using the toilet. The coloured areas show bacterial colonies grown from contamination on the hands. Ingestion of these bacteria and viruses can cause a range of gastrointestinal and respiratory illnesses including E.coli O157, norovirus, colds and flu. It is also a way in which highly antibiotic-resistant bacteria can be spread around. These are increasingly being recognised as a major threat to public health. 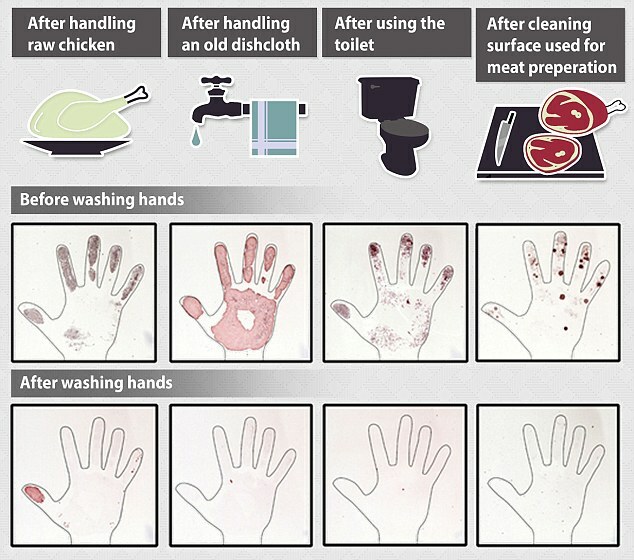 This next series of pictures show how the bacteria and viruses are removed with handwashing. It does not sterilise the hands but when done properly it greatly reduces contamination – that is why there are still some bacteria on the hands as seen in the photos. The more germs there are, the greater the chance they will cause an infection so handwashing is a method of reducing potential harm.